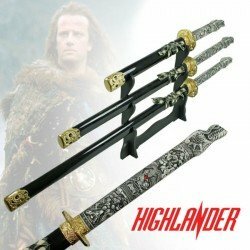 Highlander, Koi, Cobra, White Dragon three piece sets and more! 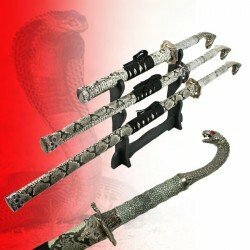 A set of cobra themed swords complete with snake skin effect scabbards and scale effect handles with grip grooves. 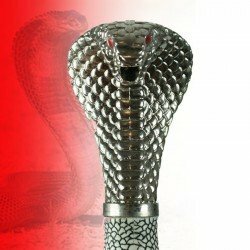 The tsuba features a cobra intertwined in a battle with a snake-like dragon. 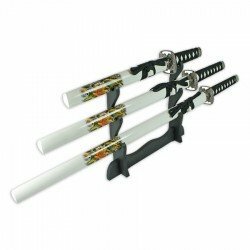 Metal embellishments are featured on the scabbards. 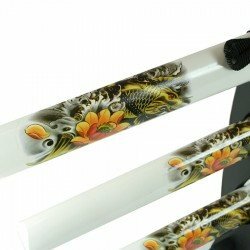 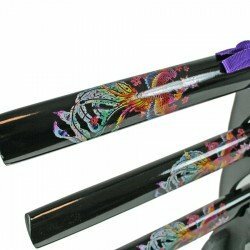 A metal ring can be found around the middle of the two l..
A set of 3 straight carbon steel swords with koi image on the scabbards. 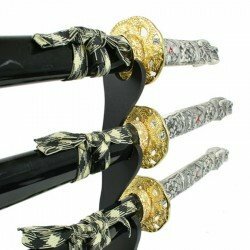 The sizes of each sword are as follows in order of large, medium, then small: Total Length: 998mm 39.29 inches Blade Length: 665mm ..
A set of 3 straight carbon steel swords with peacock image on the scabbards. 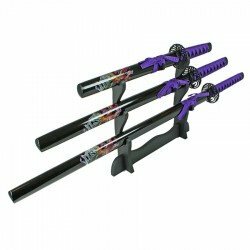 The sizes of each sword are as follows in order of large, medium, then small: Total Length: 998mm 39.29 inches Blade Length: 665m..